AMBS Architects has released the designs for the first new public library building in the city since the 1970s. Functionality, intuitive organisation and rational user-friendly design were all key concepts that shaped the building from the inside out. Designed to encourage intellectual, creative and social exchange, it will be a place where young people can come together and share ideas with each other and the rest of the world. The elegant multi-purpose building is designed to engage and empower visitors, and to encourage open exchange. Digital technology is a vital feature, which will enable interactive engagement with the rest of the world through the internet and social media. 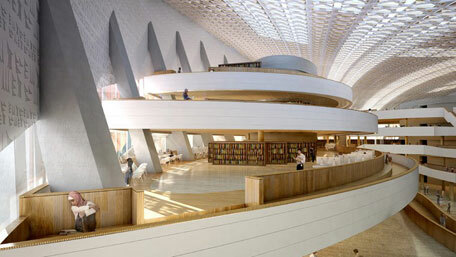 Visitors will have access to a collection of over 3 million books, rare manuscripts and journals. The practical and cultural importance of light is demonstrated through an encrypted message in the design of the roof, which forms the word ‘Read’ in Arabic, which is documented as the first word spoken by God to the Prophet in the Qur’an. More information and a gallery of photos and plans can be accessed via the links on the right. Download the full press release with interior and exterior photos. Full design information on the designboom website.